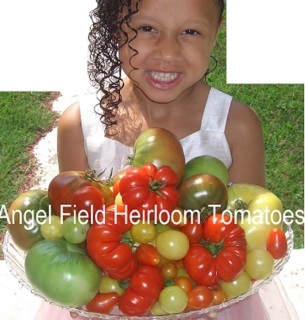 Google+ - Angel Field Heirloom Farms "Organic Seeds"
All Varieties of Heirloom Tomatoes are known by their Botanical name :"Lycopersicon lycopersicum. Historical Heirloom Tomatoes are the one’s that has been passed down over 50 years through several generations in a families, ethnic groups like the Contraband Slaves, religious or tribal group like our Native Americans here in the United States. We farm the land given to a Contraband Slave Named "Sheppard Mallory" outside of Fort Monroe in Hampton Virginia. Sheppard Mallory was one of the first 3 Contraband Slaves during the Civil War: Major General Benjamin Bulter. ​After the Civil War Sheppard Mallory call this small town Chesapeake City, before is was named Phoebus. Mallory collected many heirloom tomato seeds and heirloom plants from Native Americans along with "Native American Farming Secrecy" to farm close to the Chesapeake Bay in order to feed a growing city of runaway slaves. We are honored here at Angel Field to take care of Mallory's tomatoes, fruit and vegetable plants still growing on this property from 1869. All American Slaves, along with George Washington Caver, keep safe Native Americans farming skills, fruits and vegetables food secrets: safe in their minds and families. 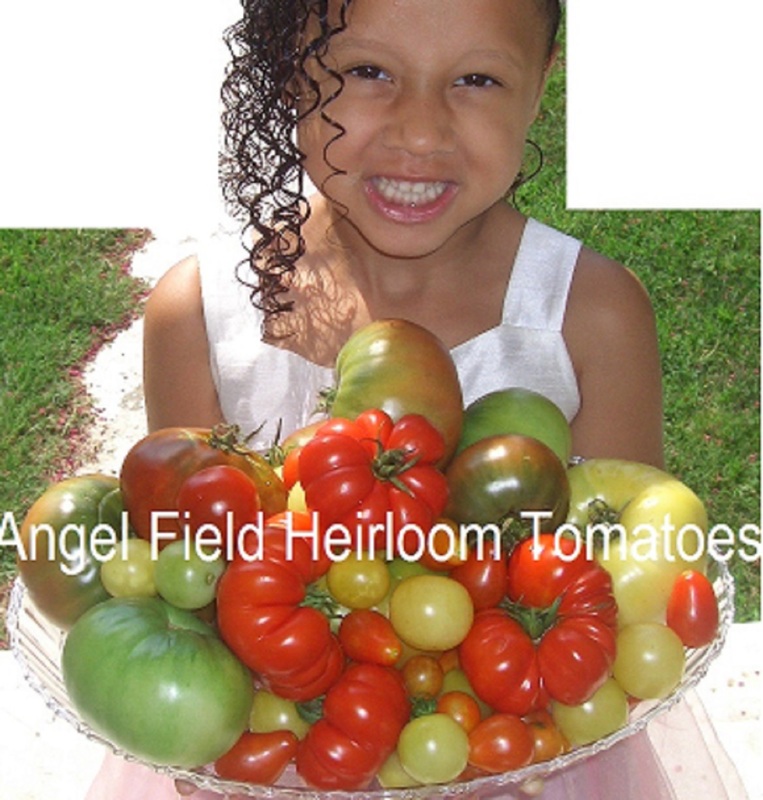 We here at Angel Field collected over 500 varieties of heirloom tomatoes looking for the description of tomatoes grown here on Sheppard Mallory Farms. We are thankful to a customer in Georgia in 2014 for letting us try his Aunt Molloy's ground Cherry Seeds. Most Heirloom Tomato were mostly grown commercially before 1940. Many early tomato farmers did not have the professional methods learned from Native Americans to grow these thin-skinned tomatoes crops. To this day, Native Americans and Hawaiian Natives keep organic growing secrets for many of their Heirloom Fruits and Vegetables safe guarded in the family history. In my research over the years of understand the purpose of Natives Americans "Fruit and Vegetables" still growing on this historical property giving to Contraband Slaves, Is by visiting Native Americans Reservations and the Native Hawaiians, and Amish communities. Native Americans farming secrets is the only way to grow these heirloom tomatoes commercially successfully. So until society can paid proper wages or crop compensate to Native Americans or any American Farmer who love growing our Nation Food Supply, we can all grow heirloom tomatoes and vegetables in our gardens. To this day, many Native Americans continues to hold on to their farming secrets as they struggle for survival to feed their own family on protected Native Reservations here in America. Organic farming along with pure naturally heritage seeds, provide your body with pure Lycopene and cancer fighting and cancer preventing diets that designed by Mother. But, it takes hard work and consistency to grow these historical seeds. With some heirloom tomato plants reaching the growth of 16 feet. I love the hard farming work, as I did as a child. The labor shortest in 1940 caused the hybridizations of our food supply with chemicals used to manage pesticides of many crops across America. My research has found that only Campbell’s Soup Company compensated some Islanders for the tomato and their growing techniques. Most of our historical Heirloom Tomatoes and Winter Vegetables, especially winter squash varieties are mostly grown successfully like Native Americans if your grow them organically with a strong support trellis. Putting Angel Field organic seeds in garden or farms, ensure your family diets is full of nature massive levels of the purist nutritional values as our forefathers. Most deep history of our Native' plants and seeds comes from Mexico and Central America where it was cultivated by the Aztecs and Incas as early as 700 AD. It was introduced to Spain in the 16th century by the conquistadors and soon spread to America, Italy, Roma, Portugal. The professionalism to grow these thin-skinned tomatoes crops organically without Native Americans farming secrets presented problems for many farmers who were unable to neither paid proper wages nor compensate Native Americans with farming contracts to maintain large crops. To this day, many Native Americans continues to hold on to their farming secrets as they struggle for survival to feed their own family on protected Native Reservations here in America. Organic farming along with pure naturally heritage seeds, provide your body with pure Lycopene and cancer fighting and cancer preventing diets that designed by Mother. But, it takes hard work and consistent to grow these historical seeds. With tomato plants reaching the growth height of 16 feet. I love the hard farming work, as I did as a child. By the 1800’s the tomato became the main course in recipes involving regular diets and cooked in most household and dinning rooms, kitchens and grown in most gardens and farms in the U.S. Angel Field Research shows Natives Americans using ground cherry tomatoes and Texas Wild Sweet Cherry Tomatoes during their migrations. Some Native American tribes and the Creoles Native already had a long history of its use. Native Americans use Texas Wild Heirloom Cherry Tomatoes on migration trials, along with other heirloom vegetables and ground cherry tomatoes plants, like the Aunt Molly's Ground Cherry. These Aunt Molly's has been growing on my historical properties since the end of Civil War with the farming knowledge of the Natives Americans. It took me 18 years to Identify the small wild tomatoes Slaves grow here with the help of Native American. The Summer of 2015 "Last year" I let all Ground Cherry Plants grow in their wild pattern, with out transplanting them like i do all wild plants until they are identified. I notice some of the Ground Cherry Tomatoes had little black lines on the outer skin and a little taller than the Aunt Molly's ground Cherry. That Ground Cherry Tomatoes has been Identifies as the "Virginia Ground Cherry". During the next 100 years after the Civil War, tomatoes were grown in home gardens, and farms across American in massive Numbers. Farmers counted on the new varieties that were developed and soon many companies dropped older Heirloom varieties from their catalogs with very little concerns nutritional values and taste. Developed tomatoes were easier to cultivate, because heirloom tomato have very than skin and at growing highs of 8-14 feet. Making the ability to ship heirloom tomatoes and heirloom vegetables great distances to their desire locations to warmer regions and colder regions with longer growing seasons until the development of Hybrids. Many super markets and farmers markets are welcoming the hybrid Tomato Varieties which were "Void of Old Fashioned Favor" and "Pure Nutritional Value", "licking of Pure Smell and Taste". So some hybrids are good to have around if the are open-pollinated. Major hybridization programs were started to breed tomatoes and different vegetables to uniform size and shape with a thicker skin to withstand shipping and cold weather. Around 1940, major developments were made in our highway and railroad systems to transport hybrid tomatoes with many new generation of Americans losing the ability to grown the same plants grown by their parents. Setting the hybridization goals to develop brighter red color, develop varieties that ripened at the same time and develop many tomato varieties resistance many diseases and pests. Many Botanist like myself committed themselves in reviving the old varieties of heirloom tomato and heirloom vegetables. It’s became Angel Field Mission to collect and understands all Native Americans Tomatoes and Vegetables. My research shows forth, Native Americans and Hawaii Native Americans have only lost 20 % of their natives’ fruits and Vegetables. With 20% lost only by some Americans Botanists renaming of Natives Plants, like the Aunt Molly' Ground Cherry. But I am very thankful to Aunt Molly for keeping this ground Native Green little Cherry Historically Tomatoes safe and sound to be identified by the USDA as a Natives Americans Ground Cherry. About 80% of the world historical tomatoes and vegetables varieties available in 1910 are "extinct" until pure seed researchers like me stated collecting and safeguarding our pure food supply. Many private collections were safeguarded by Natives Americans. Heirloom Tomato like that Cherokee Purple and Indian Stripe Tomatoes are just finding their way back to the farms and garden across American. All Farmer who farm heirloom vegetables like we do there at "Angel Field", are very committed because these precious plants are like babies, needing extra love and tender care; through-out their life cycle. Because of their nutritional value along, is worth the hard labor. Our selection of heirloom seeds is grown with protection covers letting sun in and pest out, protecting each plant Pure DNA. Angel Field Research will continue to bring you traditional varieties grown by Native Americans, Mennonites, and Amish. Recently, there have been imports of heirlooms from Russia, Germany, Italy, France, and Czechoslovakia. Also seeds from the Creole, who the West Indies, refers to as descendant of any European settler, but some people of African descent also consider themselves to be Creole. You may contact us about new varieties each year because as we continues to collect new pure varieties you would love to grow in your garden. Angel Field Research will continue to bring you traditional varieties grown by Native Americans, Mennonites, Amish and Hawaiian natives, Recently, we have collected heirloom fruits and vegetables from Russia, Germany, Italy, France, and Czechoslovakia.